An Osper allowance lets you load money automatically onto an Osper card each week or month. You can set any amount between £5 - £100 to be loaded automatically, and can be turned off at any time. Log into the Osper app using the parent username and password. From the menu at the bottom, tap 'Allowance'. Press on amount to choose how much you would like to give as an allowance, between £5 - £100. 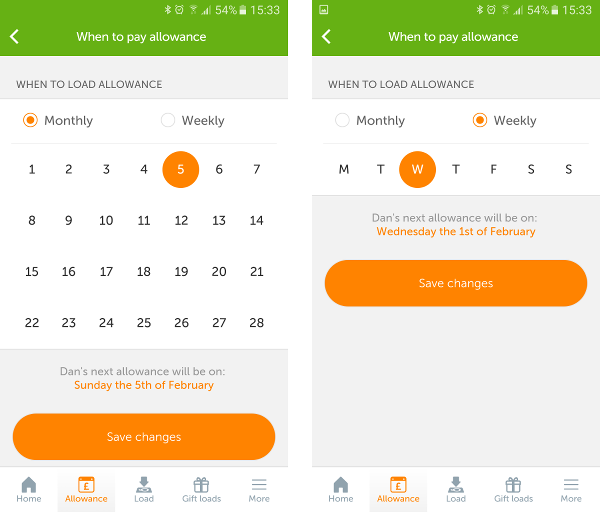 Press on when to choose when the allowance will be loaded. You can pick the same date each month or the same day each week. The allowance is now set up and the Osper card will be automatically loaded and your card debited each week or month. We will send both the parent and the young person an email when the allowance has been paid. A confirmation box will appear, tap ok to turn off the allowance. The allowance is now disabled and will not be paid again unless you activate it. To re-activate it, simply follow the same steps and tap the ‘off’ switch.